An entity is something, like an object, that can be measured or identified in the real physical world. Entity is one of the most important constructs within the Dragon1 open EA method. Almost anything can be related to an entity. Dragon1 distinguish Entity Class (EntityClass), Entity Type and Entity Instance. Working with entities gives many advantages. Once an entity is defined, data like facts and events on that entity can be measured, collected and processed. We can also model concepts and principles with entities classes and entity types. Dragon1 defines Entity Class as follows: a group of entity instances that share certain characteristics (attribute values). For instance, "Human" is an Entity Class as there are many humans. In Dragon1 we also define the term Concept. A concept is an idea, abstraction of implementation or approach. We can model a concept using one or more entity classes. For instance, "Smart Phone" is a concept. One could say that a concept is a conceptual entity, as it is an abstraction. So a Smart Phone can also be called an Entity Class, as in a group of entities. Entity Classes have attributes, relationships with other entities and functions. Examples of attributes for the entity class Human are: Eyes, Arms, Legs. Examples of relationships with other entities are: Human is a specialization of Organism. Human can have a role of Parent for another Human. Examples of functions are: Walking, Sleeping, Thinking. 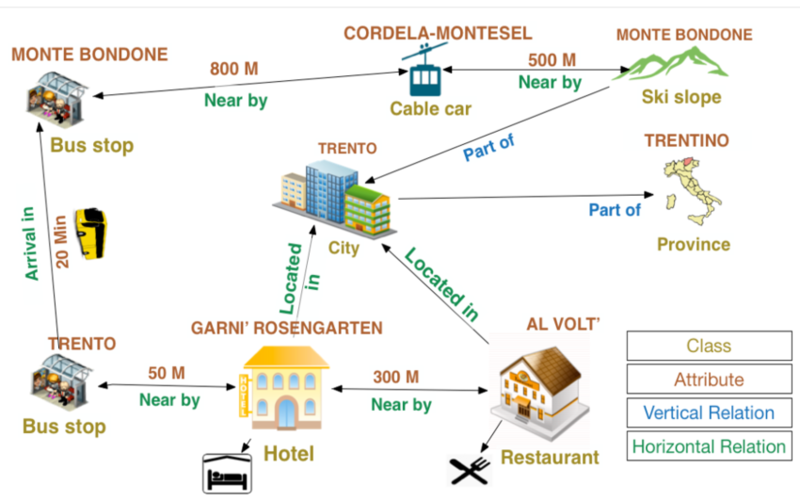 In the diagram below the concept "Hotel Services" is modeled. A hotel (as a base concept) has many concepts (subconcepts) that can deliver services. All the services can be put on a menu (at the left) so a customer has an easy overview of all the services they can use. Every hotel concept is visualized here as an entity class. You see classes visualized with an oval containing a name. The diagram was taken from the paper "Entity-Centric Visualization of Open Data". See reference below. Dragon1 defines entity type as follows: a subgroup of entity instances that relevant to be recognized. For instance, Child, Elderly and Adult are entity types for the entity class "Human". In designing entities, choices have to be made when something is an entity class or entity type. To visualize entity classes and entity types, specific formal models have been defined. Peter Chen defined ER models. Below you see an example of such an ER model. The entity types here are visualized as boxes containing a name, the attributes are visualized with ovals containing a name. You see immediately without knowing the modeling rules, a diagram of a model is hard to read and to understand. This diagram shows an ER model saying the following: Chemical and Supplier are entity types. In this diagram, the Entity Classes are not shown. The entity types have attributes like Name and Formula and Name and Contact. The entity types Chemical and Supplier have a relationship of type Order. Order has three attributes: PurchaseDate, Amount and TotalCost. Now that we have a formal model for this, we can collect data on orders, chemicals and suppliers in the same structured way. For instance, put them in a database. And with that data we can, for instance, create an invoice or check payments. An entity instance (or entity for short), is an identifiable or measurable object in the real / physical world. For instance, you are an entity instance of the human entity class. Dragon1 as SaaS platform is focused on visualizing data. In fact, entity centric visualization of data. The Content Viewer is a Dragon1 application that allows you to visualize any data file (csv, xml or other type of file) to be visualized using 250+ icons for default entity classes. Also you can provide a definition file that extends the icons for entity classes that can be used. Here is an example visualization of entity centric open data, taken from the paper about it. In this visualization the pictures that are used to visualize a class, are archetypes from the viewpoint of the viewer. The better we select archetypes of the viewers, the better a picture is understood.